With attractive white flowers and cinnamon coloured bark, Camellia yunnanensis is a species from China. Flowering in late winter to spring, masses of white flowers with standout yellow stamens cover the plant for weeks. Deep green foliage acts a great foil for the flowers. Although in its natural habitat, Camellia yunnanensis can reach 6 metres in height, in cultivation, it seems reach to around 3 to 4 metres. It is a camellia that is easily pruned to around 1.5 metres, which to us seems an ideal height for most gardens. The flowers attract bees to the garden, and it is the bees that are the major pollinators. The seed if collected can be used for oil extraction. Also known as the Yunnan Camellia and the Cinnamon Barked Camellia. The later common name referring to the attractive colour of the mature trunk. Best grown in a humus rich soil that is well drained. 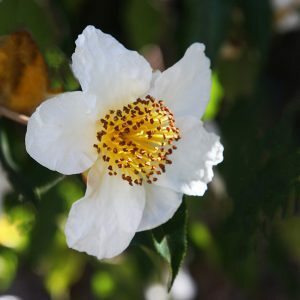 Camellia yunnanensis grows well in cooler climates and a position where it receives good morning sun and some protection from the heat of the afternoon is best. A well drained soil is essential. The addition of mulch and leaf mould will help with moisture retention as well as providing a cool root run. Good specimens can be seen in both the Sydney and the Melbourne Botanical Gardens as well as in the Dandenong Ranges. Camellia yunnanensis can be propagated from cuttings or from seed. Seed is difficult to come by as individual plants do not seem to be self fertile. Position – Afternoon shade, with good morning sun. Height – In cultivate to 3 metres in height, easily pruned to 1.5 metres.